Predicting the future has always fascinated and interested humankind. This interest has not been limited to just knowing the future but with being able to influence the future in one way or another. Predicting or influencing the future of a physical system is, in principle, possible. Predicting the future of humanity in general, or of a social group in particular, is a much more difficult, almost impossible task. Social evolution is critically affected by ideological, political, religious, and military leaders, whose appearance and subsequent actions are impossible to predict. The “human factors” affecting the development of society are so unpredictable that a comprehensive forecast of the human future must be, intrinsically flawed. At best, we can guess some possible scenarios. Beyond ideology, politics, and religion, one other human factor exerts an enormous influence on social evolution–“science and technology.” The list of science and technology discoveries and inventions that have produced profound social changes includes fire, agriculture, metallurgy, gunpowder, the printing press, steam power and electricity. Yet none of these were the result of any desire to achieve social change. The last five decades have seen technological developments at an unprecedented scale; they are likely to exert an even more profound impact on the coming five decades. 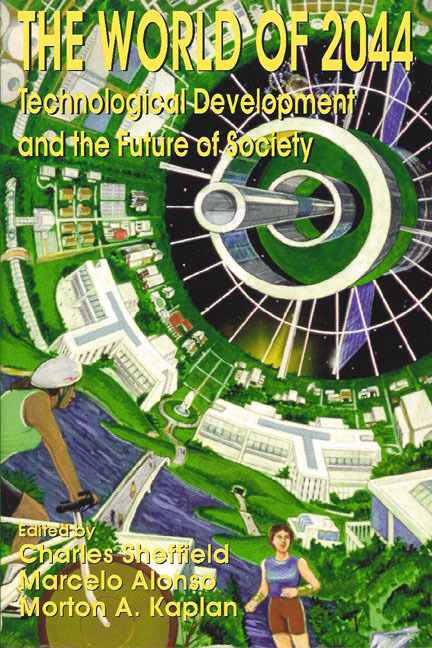 The technological forecasts in this book look specifically at developments in materials, energy, transportation, robotics, artificial intelligence, virtual reality, biotechnology, medical technology, new human habitats, and communications. What we make of technological advances is largely a result of political and moral values. The benefits of technology can be used by elites for their own gain, by tyrants to oppress, or can be shared by all. History has shown that human beings can use technology to create a heaven or a hell, a utopia or a dystopia. Noted science fiction writers Jerry Pournelle, Ben Bova, Charles Sheffield, Frederik Pohl, and Gregory Benford have written a range of scenarios ranging from optimistic to pessimistic. Several social scientists from different regions of the world have then written chapters that explain how their societies might achieve a more optimistic future and avoid a pessimistic one. CHARLES SHEFFIELD is chief scientist at Earth Satellite Corporation, former president of the American Astronautical Society, and former president of Science Fiction Writers of America. He is author of best-selling books Earthwatch, Man on Earth, and Space Careers. MARCELO ALONSO is principal research scientist at Florida Institute of Technology and former director of Science and Technology for the Organization of American States. He is the author of physics textbooks and books on related topics. MORTON A. KAPLAN is Distinguished Service Professor of Political Science Emeritus at the University of Chicago and editor and publisher of The World& I He has published many books on International Relations, Political Theory, and Philosophy.